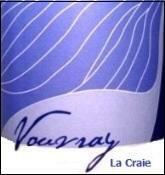 Vouvary La Craie is 100% Chenin Blanc custom cuvée from hillside parcels just outside the village of Vouvray. Produced from young vines (15- 25 years old), this bottling is almost always a light demi-sec (8-12 grams of residual sugar). A delicious introduction to Chenin Blanc! It is assembled in Vouvray, sees no wood, is bottled fresh and young, and is designed to offer the striking crispness that one expects from the Loire but with a very small amount of residual sugar for an added layer of complexity.